I thought I might share another shot from trip into the Great Smoky Mountain National Park this past spring. This trip was all about wildflowers and did I ever luck into a great bloom this year, but for all my work in the Park I only came away with a few of what I would call environmental shots of wildflowers. Most of my images were of isolated groups of flowers and not of what was also surrounding the flowers. But I was able to come away with a special shot, and that was one that pretty much summed up my whole trip. This image from the Chimneys Picnic Area was a great example of what a super boom looks like, what you are seeing is a whole mountainside of White Fringed Phacelia all along the Cove Hardwood Nature Trail that begins in the Picnic Area. The picture doesn’t give the actual scene any justice, up thru the massive hillside this beautiful little bloom blanketed the mountain like a freshly fallen snow, and if the view wasn’t enough the fragrance of this little gem engulfed you the second you stepped out of your vehicle !! 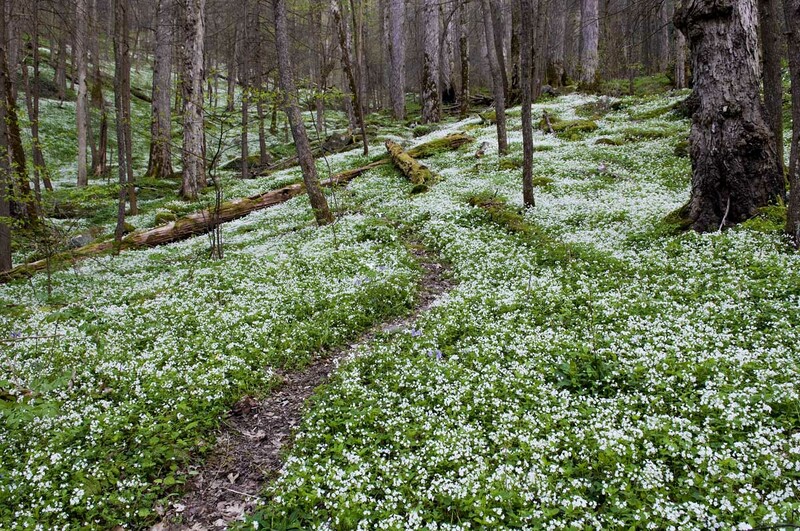 And all in between these little blooms tens of thousands of Trillium,phlox and violets and every other wildflower you can imagine interspersed the entire scene, anyone who loves to hike or just be outdoors this special spot is a must at least once in your lifetime. If you get a chance to travel to the Smoky Mountains this place is a must and there many other trails with scenery as beautiful as this, hope you enjoyed the photograph and for best results please click on the image !! Posted on July 24, 2012 by Bernie KasperPosted in art, Blue Ridge Mountains, flower photography, flowers, Great Smoky Mountain National Park, hiking, landscapes, life, Madison Indiana, madison indiana photographers, madison indiana photography, mountains, nature, nature photography, outdoors, random, thoughts, travel, Vacation, West Street Art Center, wildflowersTagged Cove Hardwood Nature Trail, Flower, Great Comet, great smoky mountain national park, Great Smoky Mountains, tennessee, Wildflower. Wow! That is indeed a special shot! How gorgeous! Really beautiful shots! I was there in April with several friends for wildflowers but because of the warm winter they bloomed much earlier than usual. Looks like you hit it just right!